If you like a cool science t-shirt then you should be checking out the fun Neil deGrasse Tyson Y’all Need Science t-shirt. 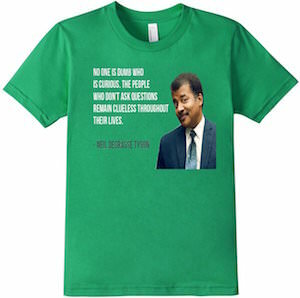 The black Neil deGrasse Tyson t-shirt is available in styles for men, women, and kids. Made from 100% cotton the shirt is perfect for anyone that love science and as expected it is available in many sizes to fit the whole family. 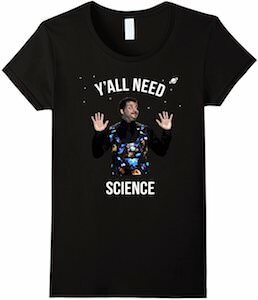 On the t-shirt you can see Neil in a cool space sweater and with his hands in the air and around him it says “Y’all Need Science”. A fun t-shirt like this is great for anyone that loves Neil and science and as if comes in styles and sizes for any ages it will make for a fun present too. 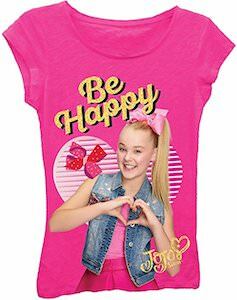 If you like to get a cool JoJo Siwa t-shirt then you just have to check out this JoJo Siwa be happy t-shirt. The shirt is hot pink and on it you can see JoJo and she is making a heart with her hand and she has a bow in her hair and there is another bow on the shirt to. And it says “Be Happy” on it and has JoJo Siwa’s name on it too. You can get this fun shirt of JoJo in many kids sizes and I am sure that you child would love getting one as a present. If you want to show the world that your little one is really smart then dress them in the toddler Albert Einstein t-shirt. 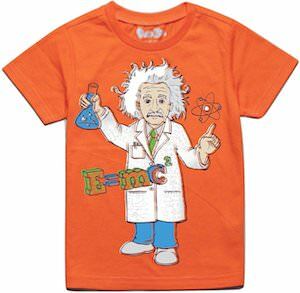 The Einstein t-shirt is available in toddler sizes 2T – 6T and comes in orange and green. On the front of the t-shirt, you can see Albert Einstein in a white lab coat doing science and on the back, you can find all kind of details about this amazing scientist. Maybe your child will become a big scientist like Einstein was and this t-shirt could be the first step into the greatness of your toddler. Taylor Swift has captured the hearts in of many musicians, producers and fans, now here is something for the kids. On this t-shirt you will see a great image of country and pop music star Taylor Swift in a long beautiful dress that has an amazing designed pattern on it, also find a print of Taylor Swift’s autograph in black. 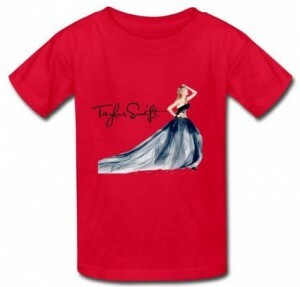 The Taylor Swift t-shirt is available in a wide selection of sizes that are in kids sizes that range from Small to XL and it will be durable and comfy as it is made from 100% cotton also check out all 5 fun colors to choose from. Get a classic looking Taylor Swift and an autograph to show off to all your friends. Taylor Swift, singer, song writter and guitar player has touched many hearts with her country and pop lyrics, this t-shirt is eaxctly that. 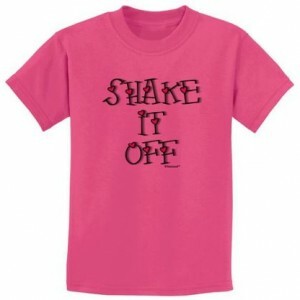 On the front of this childrens t-shirt you will find the popular chorus lyrics and title of the track from Taylor Swift’s hit song Shake It Off, “Shake It Off” is printed in black stick letters each having a heart which is so fitting for Taylor Swift. Available in a huge selection of colors so no matter what your favorite color there is one to match, it also has a wide variety of kids sizes that range from XS to XL. Support your favorite artist and lyrics with this fun t-shirt. This music sensation from Korea has all the kids dancing and grooving with Psy, now you can give the kids in your life a great t-shirt to add to their excitement. This t-shirt has a cartoon image of Psy doing his Gangnam Style dance with the words Gangnam Style above him. He is so cute. Sizing ranges from an XS to XL which will fit kids from 5 years of age to 14. It is made from 100% pre shrunk cotton. The bottom hem and the sleeve hems are double stitched for added durability because we know how tough kids can be on their clothes. There are also many colors to choose from. 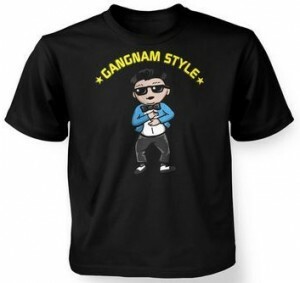 All kids loved to do the dance to the song, so get them the Psy Gangnam Style T-Shirt today. They will love it. 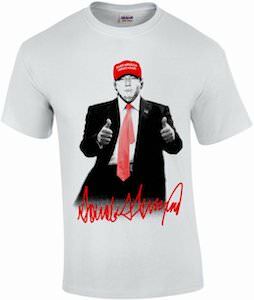 Now you can have Donald Trump t-shirt made for the inauguration in January 2017. This t-shirt is available in many colors and in style for both men and women and all these shirts are made from 100% cotton. On the shirt, you can see the president’s seal with in the middle the picture of Mr. Trump and around the seal it says “President Donald Trump Inauguration Day January 20th, 2017”. So if you want to show how proud you are about Trump being the President of the United States Of America then this is the t-shirt you want to wear.